I know. I can’t keep track either. The fog that is jet lag (who wants to be my BFF) doesn’t help much, either. I finished my internship for the Institute of Psychology this past Monday! After a few more days in Beijing, I flew to Europe to meet the Boyfriend for two glorious, is-this-real-life weeks of vacation. I am currently sitting in the Brussels airport, waiting for his flight to arrive. I am sitting in the Stella Artois Cafe, arguing with myself about getting a beer. It is Belgium, after all. However, it is barely 11 a.m. and I’m certain a beer will not help me escape from the fog. Even though I have left China behind me, it feels like an unfinished experience. Not only because I have a lot to update on the blog–including pandas (!) and the Great Wall (!! ), but due to the fact that I barely dipped my toe in the ocean of China. While traveling, you can never see everything you want to (or at least, I never can) and it’s something I’ve grudgingly learned to accept. However, when reflecting on past traveling experiences, there were one or two more places I would have liked to have seen, one or two more places I would have liked to linger. In Peru, I would have enjoyed seeing the Nazca Lines. In Thailand, Phuket remains on my list. In Ireland, I never did get to see Dublin. You get the idea–you see some, you miss some. I was not expecting this to happen to me in China, however. I went into China with few expectations, other than seeing a panda and the Great Wall, because I knew I would be devoting most of my time to work. I also mistakenly believed that the China of my imagination would be right on the surface. Instead, you have to hunt for it. China is in the midst of an Industrial Revolution of sorts, and the China you expect to see has been buried under this progress. It’s not impossible to find–I found it on the Great Wall in a thunderstorm, in a small mountain village, at an old temple in Beijing. Another thing about visiting a new places is that, within that place, there are all sorts of new places you have never heard of, and once you do, they get added to your list, as well. sorry for the repeat. it’s a good one, and I am in an airport, after all. Well, I hope to be back sooner than that, China, but either way, it’s not a forever goodbye. As you can tell by the title, we leave for China TOMORROW! We leave Denver International Airport at 8 a.m. (which means we need to be there at 5:30 a.m., GROSS) and arrive in Vancouver at 11 a.m. Then, after a three-hour layover, we fly a loooooong way to Beijing! I still can’t really wrap my head around it, but we arrive in China at 4:15 p.m. Wednesday. Which, I think, will be 2 a.m. here in Denver. We did recently (as of two days ago) get our “official” schedule for the summer. 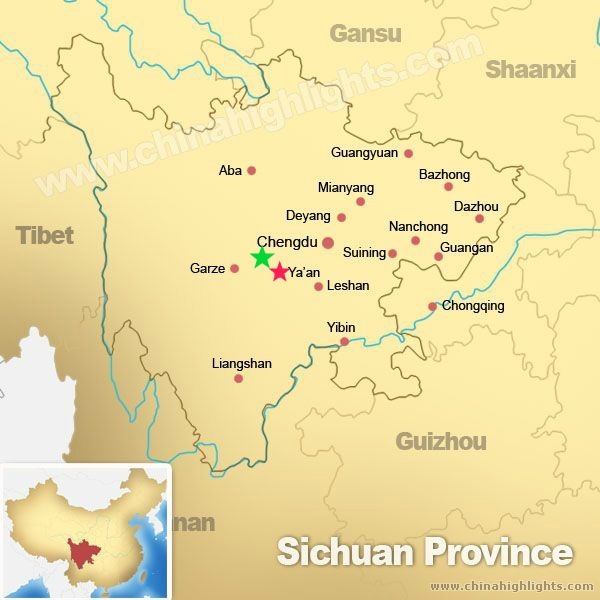 According to this, we will be in Beijing until June 16th or so, and then we fly to the Sichuan province. We’ll be attending a training given by German psychologists (is this real life?) 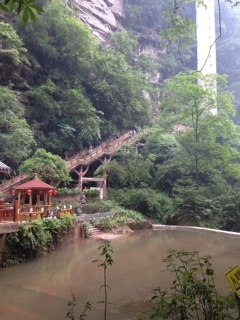 and staying in Ya’an for several weeks. 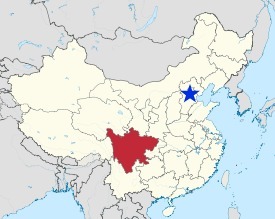 At the end of June, we’ll be moving to an apartment in the greater Lushan county until the end of July. The first week in August, we head back to Beijing! We also don’t get a day off until the end of June…but the second we do, I’m going to the Bifengxia Panda Base and hanging out with the panda kindergarten. I know. Here’s a map of where I’ll be, if, like me, the only places you can find in China are Beijing, Shanghai and Hong Kong! I’ll catch you from China!